LU Lions Rugby Program has been impressive in their four, short years of operation: USAR Division-2 National Championship in 2011, a jump to Division 1-A in 2012 and playoff runs in that elite college competition every year since. The St. Charles, MO University program has accomplished this with an exemplary instructional staff, impressive backing from the institution’s athletics department and a recruiting scheme that has lured some of the top rugby talent in the nation, including some of Colorado’s finest schoolboy flair. Head coach and Director of Rugby JD Stephenson, a Canberra (AUS) native, has assembled a formidable cohort of instructors, trainers and advisors to manage, monitor and educate the 70 student-athletes on his roster, 100% of which are on scholarship; that’s right parent – all members of the program are on some sort of institutional scholarship for rugby, determined by individual student-athlete’s financial need. Coach Stephenson employs a two-stage developmental program where the elite squad of 40 forms a pool from which Stephenson and forwards coach, Tim MacNamara*, select the roster for the Lions upcoming fixture, and the remaining 30 comprise a “developmental contingent” of players yet improving under the direction of contact specialist, Trevor Locke. Lions Rugby receives considerable backing from the University. It is recognized as a Varsity Sport with all the benefits that designation entails: scholarship funding, extra-time tutorial offerings, full access to LU’s state-of-the-art athletic facilities, trainers and medical support groups. Since 2010 and former head coach Ron Laszewski’s recruiting trip to the Rocky Mountain Challenge, Colorado has funneled rugby student-athletes to Lindenwood starting with blindside flanker Tyler Black (CS Grizzlies), as daunting a breakaway as you’re likely to see at age-grade and continuing today with significance as former Grizzlies Dallas Frye (currently rehabbing),and lastly LU’s Captain and Collegiate All American Mikey Gierlach plies his rugby trade at the Missouri University. Stephenson is ever in the hunt for rugby talent and he cruises the nation in that pursuit. A potential rugby recruit can expect a student-first setup that is, “very professional in an academy structure-type format, focused on player development, whole-part-whole, well-rounded, and versatile; teaching situational awareness,” in addition to providing a sound foundation for life beyond Lindenwood. 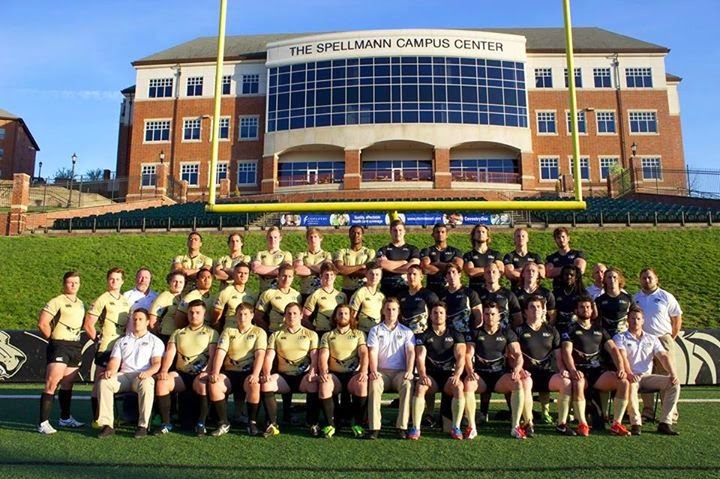 If you are a high school upper classman (or woman) and would like to investigate the possibility of playing rugby for the Lions, the best means of accessing initial information would be to go online and check out LU’s easily-navigable website and completing a recruiting questionnaire or contact Coach JD Stephenson directly at jstephenson@lindenwood.edu or 636-949-4127.